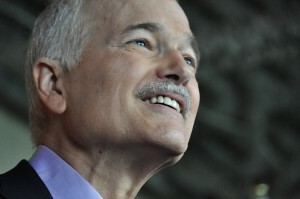 On September 29, 2012, the Honorable Olivia Chow was presented with an Ottawa Peace Award, posthumously, for Jack Layton, her late husband. “To Young Canadians” was written for the occasion at the request of the Leading Note Foundation, as a tribute to Layton, whose message it aims to spread through the universal language of music. Its text is a lyrical adaptation of excerpts from the “Letter to Canadians” that Layton penned two days prior to this death on August 22, 2011. This piece is dedicated in memory of the life and legacy of Jack Layton, and to The Leading Note Foundation’s Orkidstra program. The MP3 of this recording can be heard free of charge by clicking here (note that the MP3 file may take 30-45 seconds to download). To download the MP3 file itself, simply wait for the link to open, then right-click anywhere, and select “Save As”. The score can be viewed here (sample copy only: SATB, with soloist). SSA and SAB scores are also available from Cypress Music. Have written me to wish me well. I believe in the power to change things, I believe in the power of youth. I believe in your dreams for Canada, ray of hope shining strong and true. Canada, O Canada, I believe in you! I believe in your youthful vision, passion, energy, bonds that bind. I believe you will meet each challenge with every fibre of heart and mind. I believe in your youthful vision, generosity, justice true. So let us be loving, hopeful and optimistic and we’ll change the world. Je crois dans le pouvoir de changer, et je crois au forces de l’esprit. Je crois en tous vos rêves pour le Canada, dans cette lueur d’espoir qui brille. O Canada, O Canada, I believe in you! Login. Built by Christian Delahousse.